I learnt a new word the other day: ‘epistocracy’. It means rule by experts. It seems to me that -and I’m obviously painting with a very broad brush here- episocrats are already one of the two main ruling classes, the other being what I will call barons. Barons derive their power from their position at the summits of pyramids of patronage. Historically barons controlled large estates and functioned as military leaders. In some countries (Myanmar, North Korea) these days the barons are generals, but elsewhere they may be bankers, industrialists, owners of media empires. If they are Russian, for some reason, we call them oligarchs. I’ve thought for a long time that sooner or later there would be a reaction against the epistocracy, not only because it is a relatively privileged class, but because the hegemony of the epistocratic world view threatens and undermines more traditional sources of meaning. What first got me thinking about this was the rise of fundamentalist Islam in the 80s and 90s, but it always seemed to me only a matter of time before something similar happened in other parts of the world. A successful uprising against the epistocracy formed the backdrop to my first novel, The Holy Machine, represented, admittedly somewhat simplistically, as a worldwide uprising of religious fundamentalisms of various kinds against science*. But right now we are witnessing a real life revolt against the epistocracy in many parts of the planet. That really is what ‘populism’ is, isn’t it? A kind of politics that dismisses the intellectual frameworks within which politics have hitherto been practiced and appeals instead to those old heuristics such as religion, ‘common sense’, tribal loyalty. To be accurate, what I am calling a revolt against the epistocracy is a revolt against a section of the epistocracy (for the revolt itself has epistocrats among its leaders.) But historically, a large part of the epistocracy has allied itself politically, at least to some degree, with the plebeians -the two groups had common interests in their struggles against the barons- and considered itself to be politically on or towards the ‘left’. For many epistocrats, I assume, such an alliance was more attractive than the alternative of being the intellectual handmaidens of the the barons. (It certainly is to me.) In my new novel America City, members of this left-leaning but privileged class are referred to as delicados. It’s a massive generalisation obviously, but, as I’ve said before, I think the liberal epistocracy has somewhat lost interest in the plebeians , preferring to direct its social conscience elsewhere. The tweets below, which I noticed and saved in the immediate aftermath of Britain’s vote to leave the European Union seemed to me at the time to be symptomatic. 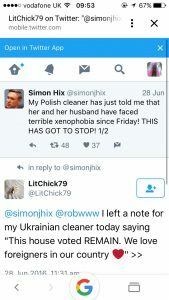 These two tweeters’ concern for their East European cleaners is of course perfectly understandable. These are people they know personally and are fond of, nothing wrong with that, and of course there is no justification for such people to be bullied in the streets. But the wail of ‘THIS HAS GOT TO STOP’ struck me as terribly revealing. It isn’t directed at anyone. It isn’t in the second person. It doesn’t even refer to the offenders in the third person, but rather to the xenophobia itself as if it was some kind of alien force that has appeared from nowhere. Yet there had been widespread unease about the scale of immigration for some time. For instance, the Migration Observatory at Oxford University  found that ‘the preference for reducing migration is a majority view among virtually all segments of British society’, including ethnic minority groups, although its prevalence was highest among white British people, poorer people, less educated people and older people. Another for instance, and a fact that no one seemes to remember: In the last Euro-elections in 2014, UKIP won more seats in the European Parliament than any other British party. I suggest that liberal epistocrats (myself included) behaved as if all of this could be ignored because it wasn’t to our liking and we assumed that people like us had sufficient power to make it go away. And now we’re finding out that wasn’t so. A revolution is going on, not against the barons, but against us. In the wake of the Brexit vote, voices could be heard among the epistocratic classes saying that this was simply the wrong result and that parliament should ignore it. (The referendum was ‘only consultative’, apparently, though no one ever seemed to mention this until the vote was counted!) I have come across liberal Americans saying that those who voted for Trump are so vile and unforgivable that they don’t even want to try and win them back. (Good luck on winning without any of them!) And there are even voices these days that say that ignorant and uneducated people should be deprived of a vote. I see, for instance, that a book by an American academic came out in 2016 (I have to admit I’ve not read it) which argued that democracy should be replaced by epistocracy in its literal sense: nations should be governed not by the representives of the people as a whole but, like Plato’s Republic. by the knowledgeable. Well, there’s always been a strand among liberal and leftwing folk that thinks ordinary people must be told what to do for their own good. Lenin, for instance, introduced the idea of a ‘vanguard party’ of professional revolutionaries who would exercise the dictatorship of the proletariat on the proletariat’s behalf. Of course, he thus created a new ruling class that (via Stalin, purges, famines and the gulag) transformed itself at length into the capitalist oligarchy we know today, having long since jettisoned any trace of the ideology which the vanguard party was formed to serve. I think myself that’s the sort of thing that tends to happen when any group of people decide they can’t share power and that the world should be ruled exclusively by people like themselves. Either that, or they are crushed completely. *My novel Marcher, and the short stories from which it evolved, also explored this theme. **Two points here. (1) Given that attitudes now recognised as sexist and racist were mainstream a generation or two ago, it’s always going to be the case that the least educated part of the population will seem sexist and racist compared to the most educated part. This is actually quite convenient for members of better educated elites who would like to have both the moral high ground and the benefits of their privileged position. (2) It is perhaps not surprising that relatively well-to-do, educated elites might prefer to foreground social divisions like gender, race, sexual orientation, ability/disability, which cut across social classes, and pay less attention to social class itself. I recently heard the Vice-Chancellor of Oxford University being questioned on the radio about her enormous salary. A harsh edge came into her voice and she barked back (from memory), ‘I hope the BBC isn’t suggesting that I don’t deserve the same salary as my male predecessor’. More comfortable to identify as a member of a disadvantaged gender, than as a member of a privileged class.